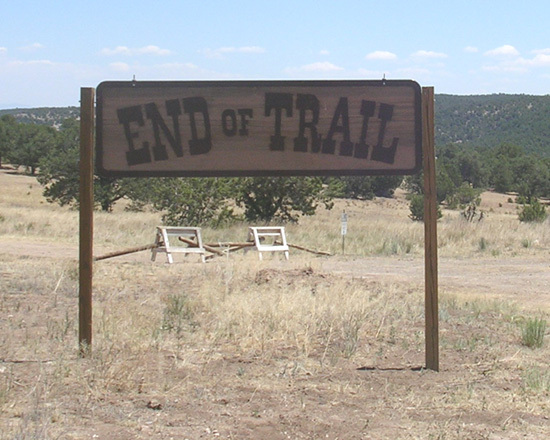 End of Trail is the World Championship of Cowboy Action Shooting. This is the event that started it all in 1982. It's grown a bit since then. There were 62 contestants in 1982. 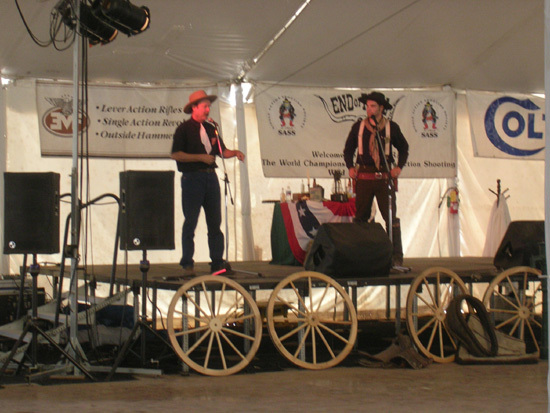 In 2006 980 shooters took part plus 60 mounted shooters, hundreds of conventioneers, workers, and vendors. All End of Trails were held in California until 2005. 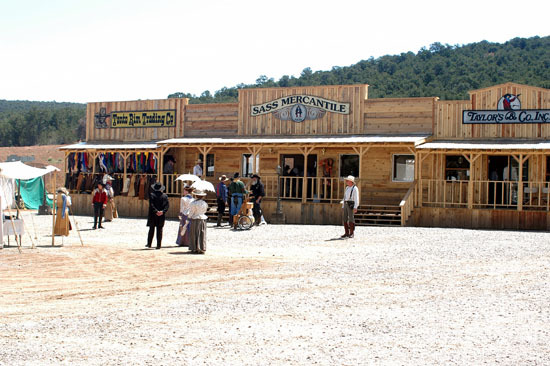 SASS purchased Founders Ranch, a 400 acre working ranch near Albuquerque, New Mexico, and began transforming it into the mecca for cowboy Action Shooters. 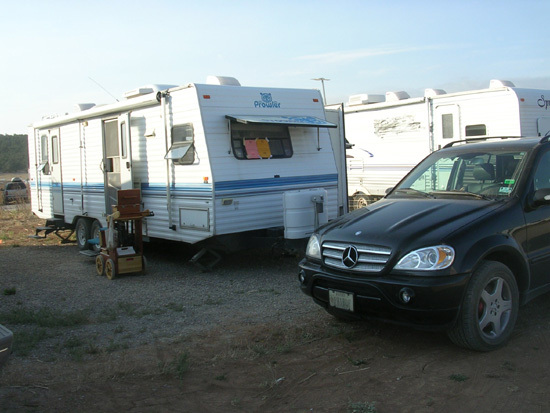 The 2005 event was muddy and held too early in the year for the New Mexico weather. The naysayers, mostly Californians who would actually have to travel to get to EOT for the first time, complained about the startup problems. But it had more contestants than any California event had, over 800, with many turned away. To solve this problem, entrants over the number that could be handled the scheduled weekend could shoot the event the weekend before with the workers. That took the lid off the number that could shoot. 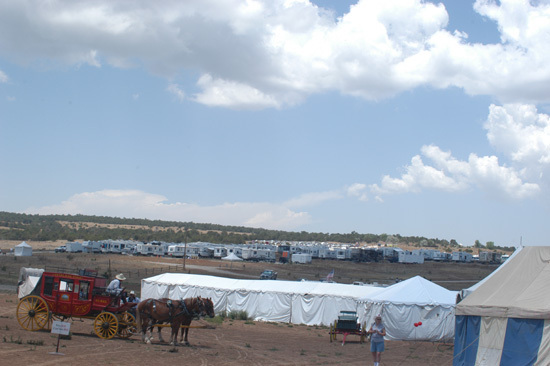 In the photo above the huge RV park is visible above the tent city that comprises most of EOT. Well over 200 RVs graced the hillside. Normally they were side by side, but the world-famous Dooley Gang arranged theirs in a square so they had a party area in the middle for their karaoke parties almost every night. 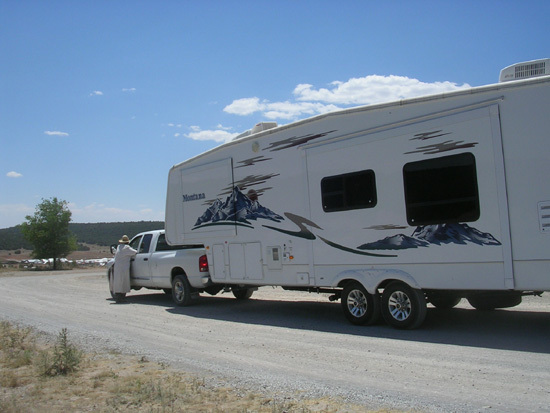 Laylow Curly SASS 57501 and Jes Pepper SASS 57502 and their new big 5th wheel RV head for the RV Park. Our trailer with Darth Mercedes guarding the front. The gun cart was left outside. Guns went inside. When the photo was taken we were out of water, and the waste tanks needed emptying. Those items were taken care of by contractors who came around and filled and emptied for $20 each. The only problem is it took them more than 24 hours to notice our request forms on the front window. That was the only trailer problem the fault of anyone other than the renting company. The lack of generator and subsequent rental of first a 5000 watt generator then a 9000 watt unit to power the AC, however, was the fault of the renting company. The rented 9000 watt generator sounded like a B17 at full throttle. The cold showers for a week because the water heater was full of scale and the non-working radio might have been foreseen by an honest renting company. Despite all that The Redhead loved it and wants to RV full time as soon as possible. 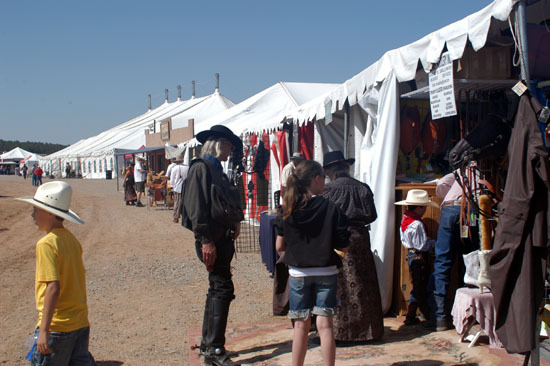 Like real old west trailhead towns, boom towns, mining camps, etc., much of End of Trail consists of a tent city that pops up for the festivities. In dead center of this photo is a chuck wagon. If you walked by it at 7:30 in the morning, the line of shooters waiting for breakfast was impressive. There are, obviously, permanent buildings to the left. 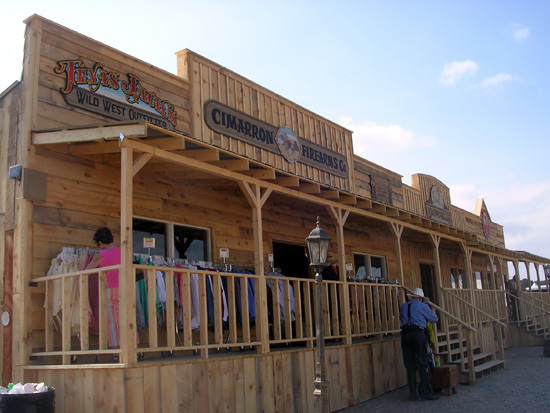 This is one of the permanent buildings, with Texas Jacks and Cimarron Firearms, Classic Old West Styles, Brownells, and Ruger Firearms. 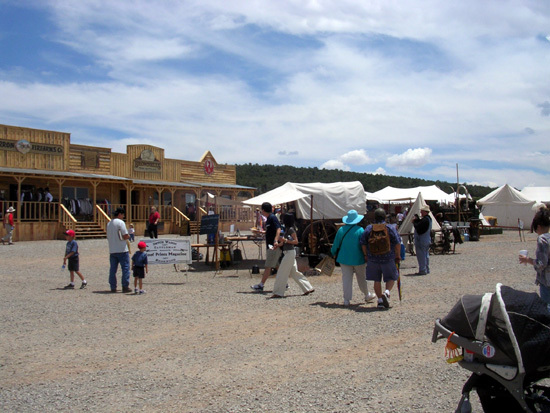 The other one houses Tonto Rim Trading Company, the SASS Mercantile, and Taylor's & Co. Firearms. Taylor's & Co. learned how to sell guns to dirty old cowboys: hire good looking women who know the product better than the average gun salesman. On second thought, she didn't have to know all that much — but she did. 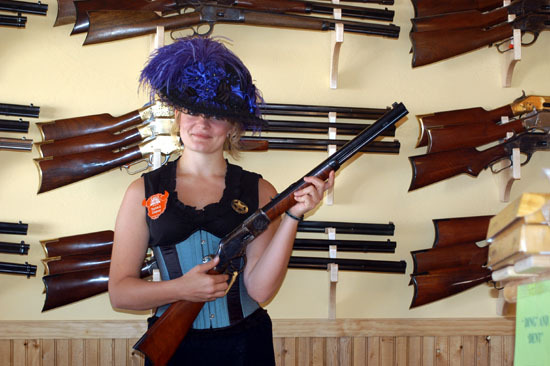 The lady is holding a Codymatic Taylor's '73 short rifle (meaning octagonal barrel) with the newly fashionable 18.5" barrel. Really well-made, beautiful gun. I bought one. It was on sale, after all. It's accurate, fast, and reliable. The quality comparison between it and my several-years old Uberti '73 Saddle Ring Carbine is astounding. Uberti has improved mightily. Of course, getting one that Cody Conagher has worked on guarantees not only a great short-stroke action job, but that the basic gun was in spec. If it wasn't, he could have sent it back to Taylors' and gotten a different one. They had 4 in stock when I got there, and all were equally beautiful and well-fitted with action jobs and trigger pulls indistinguishable from each other. I finally picked on the basis of serial #. I went back a couple of days later to show a possemate what a Codymatic was, and they were all gone. Next year bring more, folks. I might want a spare. Ruger ace West Fargo was working on contestants guns, too. Several good SASS Gunsmiths (Coyote Cap is another) spend most of End of Trail fixing guns for contestants, generally without charging. CAS is that kind of place. 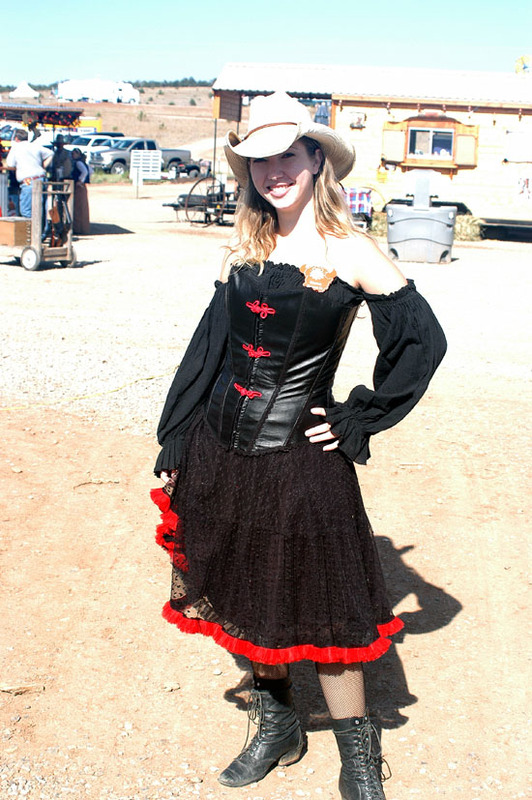 Here's the Cimarron girl out in the sunshine. Yes, she stopped traffic. 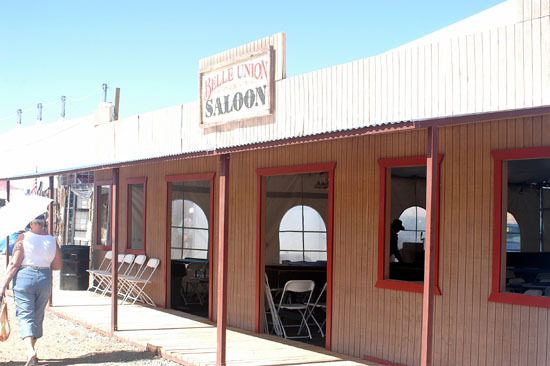 The Belle Union, the official Saloon of SASS. All guns were long banned from town by the time it opened. This is Painless Potter from the Little River Raiders in Victoria, Australia . 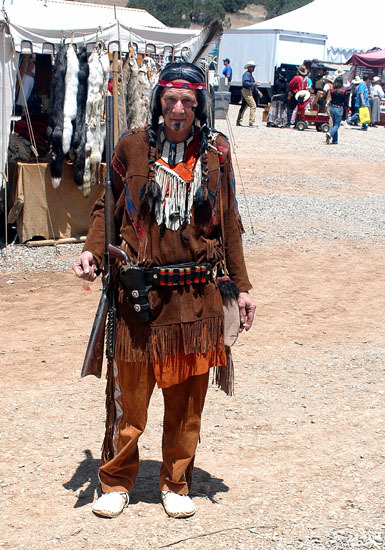 He and another gentleman dressed as Native Americans. One was a Sioux, one a Cheyenne, with war paint, etc. Both spoke with accents. When I asked what tribe's dialect they were speaking, they replied it was the really southern Cheyenne and Sioux. They were part of the huge Australian contingent (40+). The Winchester is an antique. Both of them knew American history from the Native American viewpoint. Ringo Fire, obviously in B-Western garb. Ringo is a professional comedian and has great stage presence if he would just come out of his shell. I thought Ringo was a lock to win the Best dressed B-Western costume contest. 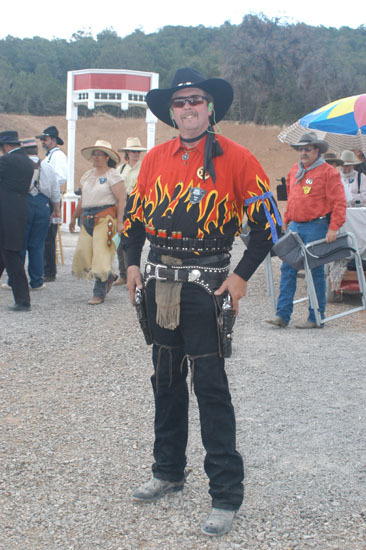 He had an outfit wilder than this, a sidekick, and some ladies as a rooting section. But he shot on the late shift that day. Like many other really well-dressed B-Westerners, such as Jack Houston, Starring as the Lone Rider and his wife Biggest Heart, he finished shooting after the contest was over. I heard a Wild Bunch member say, "We're going to fix that next year." I hope so. Things like this put a lot of hard work to waste. Things went awfully well at EOT, but the scheduling of costume contests when some contestants can't get to them persists. It's curable, though. 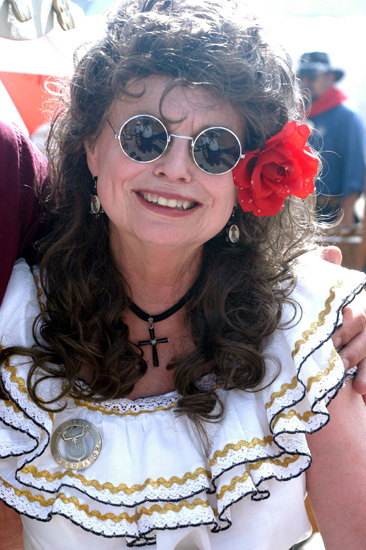 Handlebar Bob is a past "Silver Screen" category costume winner. 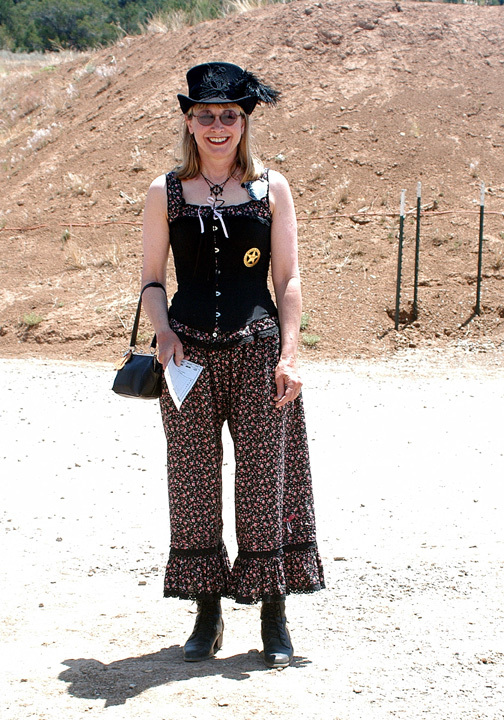 Cat Ballou, the REAL editor of The Cowboy Chronicle, is the impetus of the continually improved costume contests that are going on at major SASS events. SASS involves Shooting, Socializing, and, as shown here, Shopping. 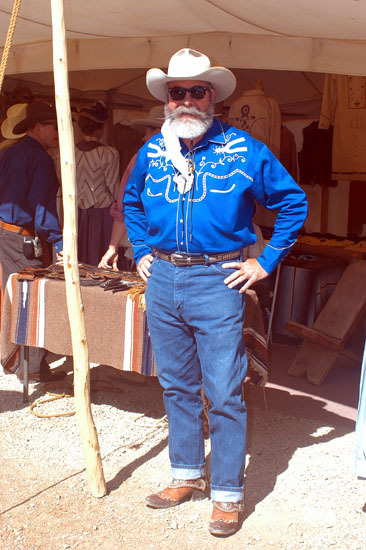 EOT is a huge festival of the old west with entertainers in multiple locations all day. Here are True West editor Bob Boze Bell and world champion gun spinner Joey Dillon. His guns and costume were on an airplane somewhere, and everything was borrowed. This led to gun dropping since the balance was different. I've seen Joey Dillon's act before and never saw him drop anything, so this was a bit of a shock. It was entertaining anyway.